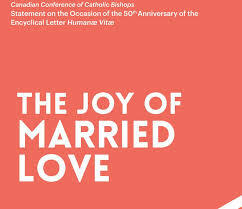 =Written in an accessible and uplifting style, it aims to inspire and provide encouragement to married couples, highlighting the promise of joy which is at the core of Humanæ Vitæ. This anniversary text also acknowledges the continuing implications of the Encyclical in today’s society as well as its centrality in Pope Saint John Paul II’s Wednesday Audiences on the Theology of the Body and Pope Francis’ post-synodal apostolic exhortation Amoris Lætitia. Approved for public release by the Permanent Council on 21 June 2018, the drafting of the text was undertaken by the Commission for Doctrine in collaboration with the Catholic Organization for Life and Family (COLF). The statement can be accessed in PDF format at the following links.